Crown Prince of Abu Dhabi Sheikh Mohammed bin Zayed Al Nahyan arrived in New Delhi on Wednesday to a warm welcome by Prime Minister Narendra who went to the airport to receive the "special friend". During Al Nahyan's three-day visit, his first to India, the two countries will discuss ways to enhance ties in a range of areas including energy, economy and security and are expected to sign a number of agreements in sectors like oil nuclear energy, IT, aerospace, railways and electronics. "A special welcome for a special friend. PM @narendramodi personally receives HH Sheikh Mohammed bin Zayed Al Nahyan," tweeted the PMO with a photo of the two leaders shaking hands at the Palam Technical Airport. 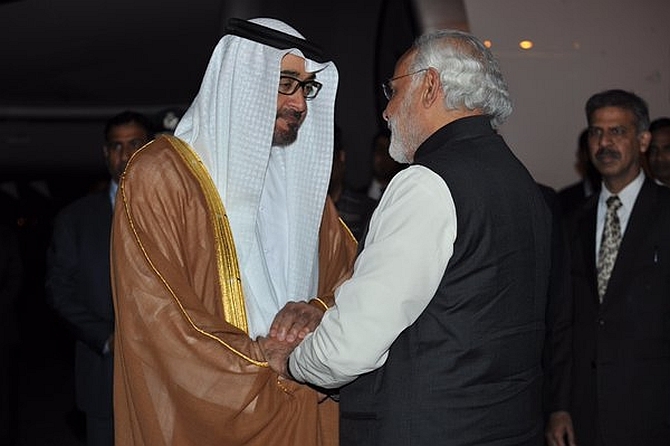 Modi had visited UAE in August last year, the first by an Indian Prime Minister after a gap of 34 years, and Al Nahyan had received him at the Abu Dhabi airport. 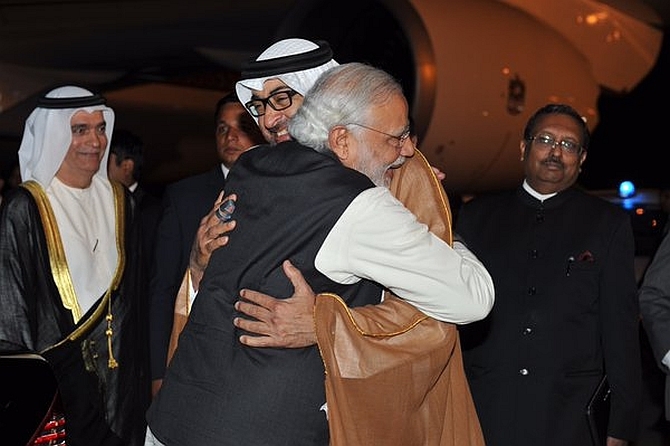 "This is Sheikh Mohammed's 1st state visit to India & am glad he is visiting with his family," Modi said in a tweet. "Sheikh Mohammed is a visionary leader. His visit will add new vigour and momentum to comprehensive strategic partnership between India & UAE," the Prime Minister added. Al Nahyan, also the Deputy Supreme Commander of UAE armed forces, is accompanied by a power-packed delegation for his three-day trip till February 12 which includes several top ministers and over 100 business tycoons and CEOs of top companies. Official sources said Modi went to the airport to receive the Crown Prince without any disturbance to the normal traffic in a compact carcade without having any ambulance. The two leaders will hold detailed deliberations tomorrow following which both sides are expected to sign a number of agreements to expand cooperation in sectors like oil nuclear energy, IT, aerospace, railways and electronics. Ways to contain radicalism, stepping up counter-terrorism cooperation and dealing with the ISIS are likely to figure prominently in talks Al Nahyan will have with Modi on Thursday. Economy of UAE, one of the leading producers of oil, has been hit hard by falling crude prices and it is expected that the Gulf nation would like to invest significantly in India's energy and infrastructure sectors from its sovereign wealth fund of around USD 800 billion. India has been eying the fund, being managed by the Abu Dhabi Investment Authority, for its infrastructure sector including for railways, ports and roads. Not just smart cities, govt promises houses for Rs 5 lakh! Will BCCI's SGM on Feb 19 accept Lodha panel recommendations?